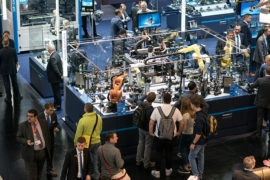 Saturday 9 October saw the close of 27.BI-MU/SFORTEC, the biennial machine tool, robot and automation exhibition held in the Fiera Milano Exhibition Centre. 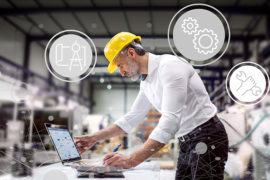 With 60,047 visits, 27.BI-MU/SFORTEC confirmed its status as the reference event for operators in the world manufacturing industry, attracted to Milan by the broad and varied offering presented by 1,223 companies over a total exhibition area of more than 90,000 square metres. With 2,996 international visitors from 75 countries and 44% of exhibiting companies from abroad, the event promoted by UCIMU-SISTEMI PER PRODURRE highlighted its international character. The broad and varied sector offering on show at 27.BI-MU, focusing on about 3,000 machines on display having an overall value of 300 million Euros, was superbly backed up by an impressive programme of collateral events designed to valorise participation by operators visiting the event. 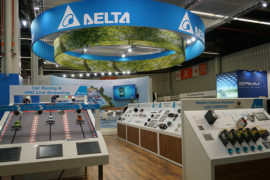 Specialist events such as THE WORLD OF WELDING, THE WORLD OF ASSEMBLY, THE WORLD OF DIES and THE WORLD OF FINISHING joined forces with the conferences of QUALITY BRIDGE attended by 900 people dedicated to analysis of technical topics of major interest to sector operators, and PIANETA GIOVANI, the area dedicated to 5,005 students from high schools and universities. 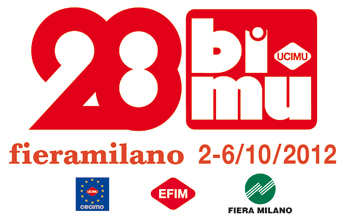 In keeping with tradition, 27.BI-MU – the key event of the entire show – was the theatre for promotion action for Made by Italians in the sector, coordinated by UCIMU-SISTEMI PER PRODURRE and ICE, that involved the organisation of a cycle of meetings between Italian exhibitors and 90 user companies from every part of the world. 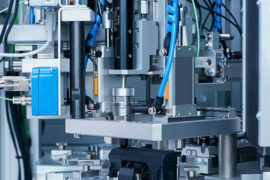 The biennial machine tool show was flanked, as usual, by SFORTEC, the technical subcontracting, components and structural processing exhibition promoted by CIS-COMITATO INTERASSOCIATIVO SUBFORNITURA.